High Quality. Best Prices. Fast Turnaround.  At Tomahawk, we strive to offer personal customer service, answer any questions thoroughly and exceed your printing/ design expectations. Tomahawk offers little to no minimums on decorated items. We want to be your “go-to” for any of your promotional needs. Take a look at some of our work here on the website or click on either of the social media tabs at the top as we take snapshots of current and past orders there.